The article “Change Gmail Background Theme With Customize Background Picture” will show you how to add a personal photo as a background image in gmail. It will change the gmail theme with a personal background image. Add of personal background photo in gmail is a small part of change theme in gmail. Also Check: Some working keyboard shortcuts on yahoo mail! 1. Login to your Gmail Account using your Google Account ID and password. 2. Click on the Setting (the gear icon) at the upper right hand corner of Gmail. 3. Choose “Setting” from the drop down menu. 4. Navigate to “Themes” tab. 5. Scroll down the horizontal scroll bar till the “Custom theme” section. 6. You will get two option. Light– The theme will be set as light color. Dark- The theme will be set as dark color. Choose the color depth by choosing any one of them (Light or Dark) on the Custom theme section. 7. After that you will get an option “Change your background image” below that. 8. Click on “Change your background image” to add a personal photo as a Gmail background picture. 9. A new pop up window will open to “Select the background image” for Gmail. 10. You will get 6 options to choose the background photo. 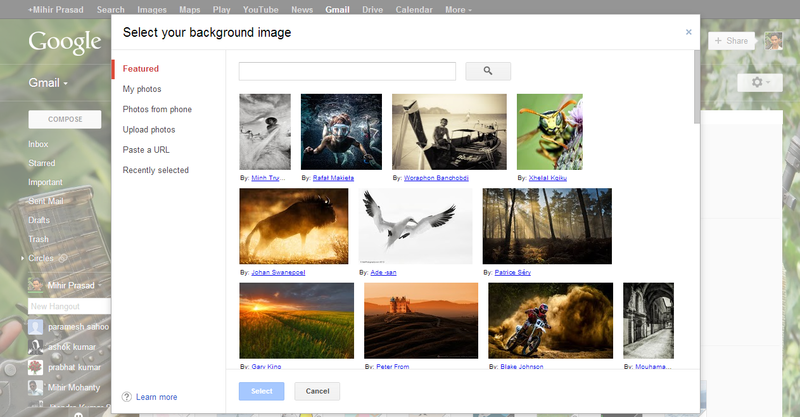 Featured: Choose your background photo from some of the featured image from Google. My Photos: Choose your background photo from your Picassa Web albums or the Google+ photos uploaded by you. Upload Photos: Manually upload a photo from your computer/PC and set it as background image in gmail. Paste a URL: Copy and paste the URL of the photo that you want to see on your Gmail background. Recently Selected: show you the list of photos that you recently set as your email background. 11. Choose a photo from the above sections and click on “Select”. 12. Wait for some time. It will change the background photo of gmail and show you.